This December 18, the Moon will located on the same side of the Earth as the Sun and will not be visible in the night sky. This phase occurs at 06:30 UTC. This is the best time of the month to observe faint objects such as galaxies and star clusters because there is no moonlight to interfere. This February 11, a penumbral lunar eclipse occurs when the Moon passes through the Earth’s partial shadow, or penumbra. During this type of eclipse the Moon will darken slightly but not completely. The eclipse will be visible throughout most of eastern South America, eastern Canada, the Atlantic Ocean, Europe, Africa, and western Asia. December 14th will bring the third and last of what is known as the “supermoon.” The Moon will be located on the opposite side of the Earth as the Sun and its face will be will be fully illuminated. This full moon was known by early Native American tribes as the Full Cold Moon because this is the time of year when the cold winter air settles in and the nights become long and dark. The third supermoon has also been known as the Full Long Nights Moon and the Moon Before Yule. This Moon will be at its closest approach to the Earth and may look slightly larger and brighter than usual. 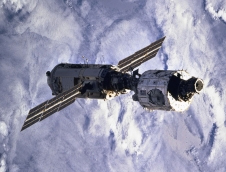 The connected Zarya and Unity modules after Unity was released from the Space Shuttle Endeavor’s cargo bay. Fifteen years ago on Nov. 20, 1998, the Roscosmos (the former Russian Space Agency) launched a Proton rocket that sent the Zarya module into space. This was the first section of the International Space Station. Two weeks later on Dec. 4, the United States launched the Unity module making the 2 modules a real international space station. The ISS is now the third brightest object in the sky after the sun and moon. If you know where and when to look you can easily see it without a telescope, and NASA’s Mission Control at the Johnson Space Center in Houston can tell you when and where. Log onto Nasa.gov to receive e-mail or text alerts a few hours before the ISS will be passing over your area. If you sign up soon you might even be able to spot it while “comet hunting” during the Thanksgiving holiday. Here at the Irene W. Pennington Planetarium we have several shows that include information about the moon. One of the things I’m asked about is why do we only see the one side. Some people seem to think that moon doesn’t rotate at all; some people think the “dark side” of the moon is always dark. So let’s clear some things up about the moon and illuminate why that “man in the moon” always faces us. On Friday, 18 October, this month’s full moon occurs and with it, weather permitting, we’ll see a penumbral lunar eclipse – so called because only the full moon passes through the outer bright rim of the Earth’s shadow, or penumbra, as it rises in the east at sunset. 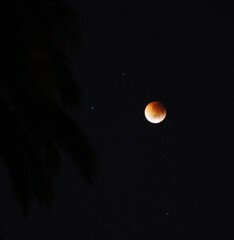 Unlike total eclipses, in which Earth’s umbra — the central region of its shadow — darkens the moon entirely, a penumbral lunar eclipse involves only a slight dimming. Still, sky watchers should expect to see a much more subtle sight with a maximum shadowing on the lower half of the full moon occurring at 6.50 pm. CDT. Sky watchers should start observing the moon at sunset. Best place for observing this Friday’s eclipse is in Europe, Africa and the Middle East where it will be visible as a total eclipse. From Baton Rouge however, this penumbral eclipse should last about 45-minutes. The next lunar eclipse to be seen from our area will be Tuesday, 15 April 2014. Mark your calendars! Phobos has a large crater known as Stickney. Deimos is slightly smaller than Phobos. 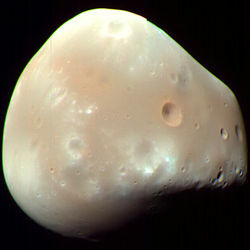 Mars has two moons, Phobos and Deimos. They are very different than our moon in more ways than one. Our Moon orbits Earth at an angle, while Mars’ moons orbit about the planet’s equator. Our Moon is 3474 km across, making it nearly a quarter of Earth’s size. Phobos is about 25 km across, and Deimos is about 10 km across; comparable in size to down town Baton Rouge. Our Moon takes 27 Earth days to orbit one time, Mars’ moons orbit much faster. 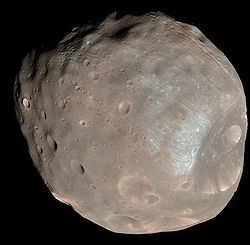 Phobos, the larger and closer of the two, orbits quickly, circling Mars once every eight hours. Deimos, the smaller and farther of the two, orbits slower, circling once every 30 hours. From the point of view of a person or robot on the surface of Mars, Phobos eclipses Deimos frequently. This is because the two moons orbit in nearly the same plane. Last week this was photographed for the first time by Curiosity. The spacecraft took a series of images, a sort of timelapse, that scientists here on Earth made into a short movie. Phobos looks vastly larger than Deimos, this is merely because it is closer.